Whenever I need a pen, it's gotta be in a pack of several colors because of my addiction to color and organization of said color. A dry erase board hangs on my fridge to remind myself to do chores and foods to add to my shopping list since nobody's around to nag me but myself. Instead of storing these markers in a mug or put magnets on them to stick to the fridge, I decided to use a thrifted item that fits them perfectly. 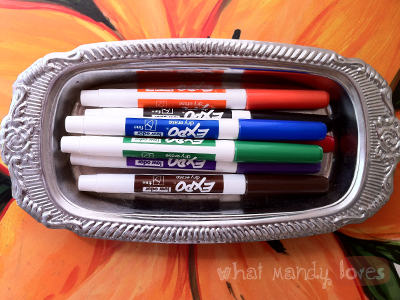 Soap tins make great decorative pen holders if you can find one long enough. Some of you may be screaming "No, don't store them lying down! Keep them upright and upside down or the ink is going to dry out faster!" 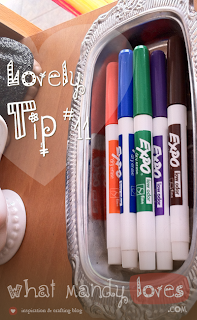 Yeah yeah, I usually do this (my regular ink pens stand this way in a metal cup), but since I use these tiny colored pens all the time I haven't noticed them drying out more than my other dry erase markers stored upside down SO THERE. 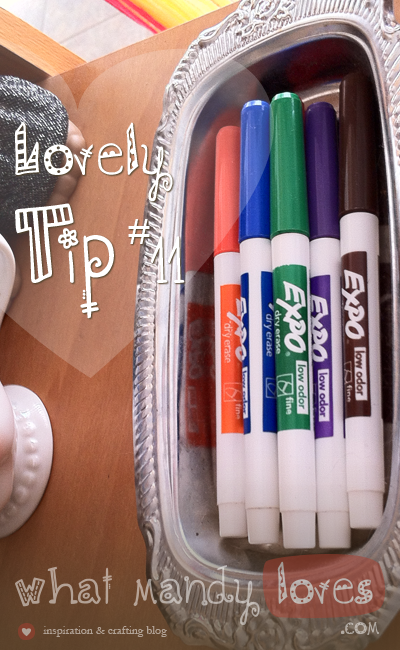 How do you display or store your dry erase pens? Let me know in the comments. Hey Mandy, an alternative for those people who want to store their pens upside down would be a matching bathroom cup. Many times in stores you can find "sets" of individual items that go together. A decorative cup would work.